Integrating two organisations with established identities and strengths is never an overnight process. Much preparatory work has been completed, but the process of integration will continue for some time, so this is an outline of the programme. From today all communication will be branded with the new BPDA identity. Please amend your details accordingly. The new website replaces the CPSA and BCA sources, although searches for the old sites will be seamlessly redirected. All newly created material will carry the new BPDA brand, but our substantial library of CPSA and BCA documentation will be rebranded in a gradual process over several months. As a subscriber to the current online newsletter, you will continue to receive updates that will keep you informed of the activity of the expanded organisation, with the option to unsubscribe at any time. With the combination of resources and a new energy in the Group, the BPDA is ready to launch a number of new initiatives over the coming months. 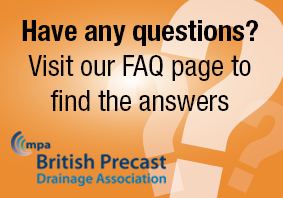 Look out for a new Technical Guide now encompassing precast concrete pipes, manholes and box culverts, user-friendly FAQ facilities and an Advanced User option for our highly popular pipeline Material Cost Calculator. Look out also for our new BPDA branding in our advertising and PR activity on-line and in the trade press.